What they say: My heart belonged to Branch and Brooks Valentine since we were children, when we were all too naïve to know what that even meant. We didn’t understand that when we became adults, love would change us. I had to make a choice and when I did, it ripped our bond apart. Brooks left town, and he took half of my heart with him. It was difficult, but I coped and planned my future with Branch. I thought I’d made the right decision. I loved him and I always had. Almost three years, one beautiful little girl and an abusive marriage later, I was standing there staring at the man that would always hold my heart. The only question was… Would I give it to him? I’m Katy Michaels and this is my story. 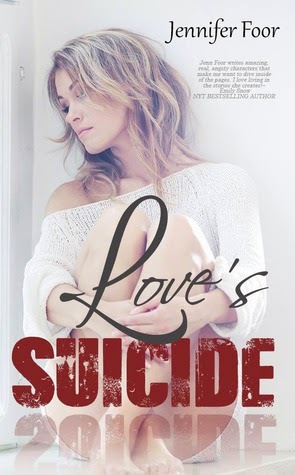 What I say: I featured Love's Suicide as a former Waiting on Wednesday post because the idea appealed to me. The story was a lot more dramatic than I was expecting (this isn't necessarily a bad thing) I just wasn't quite prepared for the level of angst Katy faces. The three main characters are Katy and her next door neighbours, twins Branch and Brooks. I've read several books where the female MC picks the wrong brother but the difference in Love's Suicide is the level at which everybody seems to suffer. I wasn't the biggest fan of Katy because she constantly makes terrible choices and can be really thoughtless. Essentially though Katy is a really sweet girl who is easily manipulated but by trying to do the right thing, she does the wrong thing.There were several woe-is-me moments when I felt Katy needed to stop feeling sorry for herself and stop relying on other people to fix things and make amends herself. But the cruz of the matter, and Katy's saving grace, is that she's not vindictive or horrible - she's just naive and a little impulsive. I really liked Brooks and I felt he put up with a lot from almost everybody. Considering he's supposedly the lesser brother/bad boy, he sacrifices a lot and is really selfless. The guy has seemingly endless patience, love and understanding. Branch has a lot to answer for and I felt slightly cheated because I wanted to see him face up to his actions a lot more. Also considering what Katy does I still found myself really annoyed with Mel and thought she got away with a lot too. I didn't see the Bobby storyline coming. I felt certain parts where Bobby was concerned were a little convenient and I managed to both like and hate him. Plus don't get me started on Sarah! The strange thing is that even with all the angst, drama and frustration I did still really enjoy the story and really wanted to see Brooks get his HEA.